I was asked to create a Bee Hive cake for a baby shower. I was given pictures to use for ideas and went with it. I decided to create a trial cake to make sure what was in my head could be created with cake. I used 4 layers of chocolate cake (one 6", two 8", and one 9"). 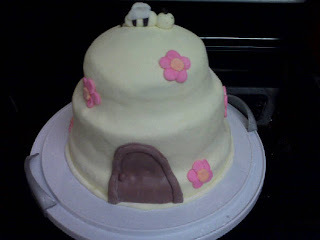 I then frosted it with vanilla butter cream and pale yellow marshmallow fondant. 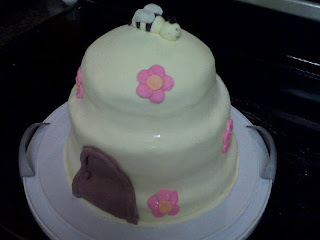 The cake was decorated with a little door, flowers and a bee to top it off. Along the way I came across some frustrations. I only have one counter large enough to roll out fondant and have the space for decorating. What I forgot about was that my dishwasher was running while trying to roll fondant and decorate. You might be thinking "how did you not know it was running?" Well, my dishwasher is brand new and pretty quiet, and I was so into the decorating that it didn't even cross my mind. To make a long story short, fondant and heat don't mix well at all, and the heat was coming up through the counter the entire time making many issues. I finally realized towards the end that the dishwasher was running because steam was coming out of it! OOPS!!! Lesson learned! Needless to say, its not a perfect cake, but it served its purpose and was gone in no time by my co-workers. I will definitely revamp for next time! The pictures also came out dark, which I didn't realize until it was too late!